Seeking care in the event of a dental emergency is crucial to dental health and wellness. If you have an urgent dental issue, contact Frost Dental Group immediately at (201) 438-8870. During office hours there is always at least one doctor tending to emergencies requiring prompt treatment. Our office provides on-call service for emergencies, 24 hours a day, seven days a week. When you call, one of our emergency dentists will be contacted immediately and will reach out to you as soon as possible. Our team understands how painful a sore tooth can be – whether decay has created infection or a tooth was severely broken and is uncomfortable. Our emergency dentist, Dr. Lee T. Frost, treats patients with problematic teeth, restoring comfort, function, and aesthetics. Don’t put off treatment for a toothache! Seek care from our office immediately to avoid extraction and provide pain relief for problematic dental issues. Dr. Frost and his team treat a variety of dental emergencies, including infection and abscesses, broken and cracked teeth, damaged prosthetics, loose dental crowns, and knocked-out teeth. 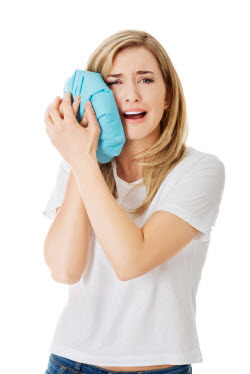 Whether you’ve bitten into something hard and chipped a tooth, or lost a tooth in an accident, our office is here to help. Same-Day Dental Implant Placement and Restoration – Teeth that have been knocked out entirely can be replaced with implant dentistry at our office. While some natural teeth can be restored to their original location, if handled properly, other instances call for prosthetics. Dr. Frost can place your new dental implant and a temporary tooth in one appointment. Emergency Root Canals – For tooth infections, and large cracks in dental enamel, Dr. Frost provides endodontic treatment. Root canal therapy helps to eliminate bacteria and preserve your tooth. Tooth Extraction – When a tooth is damaged beyond repair, however, extraction and prosthetic replacement may be required. Dr. Frost and his team provide restorations in the event of a missing tooth, including implant-supported crowns, dental bridges, and partials. Contact our Emergency Dental Office! With several dentists on staff, we are always able to give prompt attention to emergencies. To reach one of our dentists after regular office hours, please call (201) 438-8870. Due to the unscheduled nature of emergencies, occasional delays in the appointment schedule do occur. We hope that you understand that these delays are unavoidable, and that in a dental emergency you would be extended the same consideration. It is important to call our office immediately to make an appointment. In the meantime, use a cold compress and over-the-counter medications to relieve pain. Our emergency dentist in Rutherford will reposition the tooth and add splints to stabilize it. If the tooth fails to heal, root canal therapy might be required.